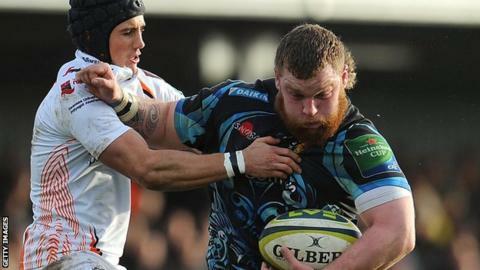 Newport Gwent Dragons have signed Exeter Chiefs prop Lloyd Fairbrother on a three-year deal. The 22-year-old tight-head, who is Welsh qualified through his Blaenavon-born mother, will join the region in the summer. Fairbrother has also played for Moseley, Cornish Pirates and Plymouth Albion. "I am delighted that Lloyd has signed a contract with us," said Dragons director of rugby Lyn Jones. "He has shown great promise through learning his trade with Exeter. "The key part with him is his development; I want to spend time continuing the good work that Exeter has done with him, making Lloyd the best that he can be. "He has outstanding ability and I look forward watching him develop as a player in the Dragons squad."